The human body naturally wants to maintain its weight. When you first try to lose weight, your body may fight the changes you are trying to make. It can take a lot of effort to train your body, and most people give up on losing weight before they are able to do so. Lean EFX Refined from Formutech Nutrition can help you get control to break past the limits of your body and start to shed your extra weight. Are you sick of being stuck where you are? With Lean EFX Refined from Formutech Nutrition, you're in the driver's seat on the road to a better looking and a better feeling YOU. 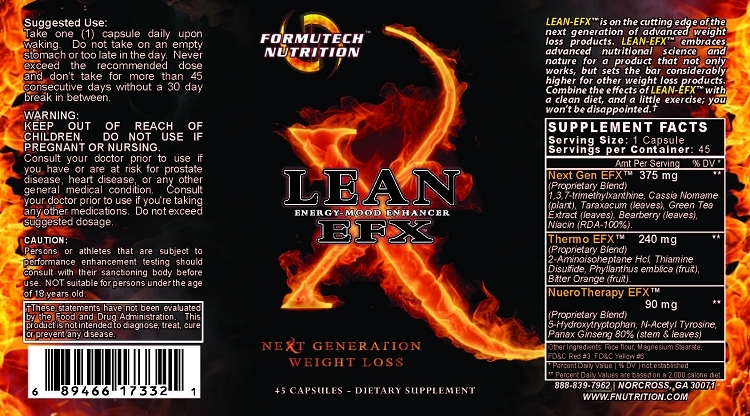 What is Lean EFX Refined by Formutech Nutrition? 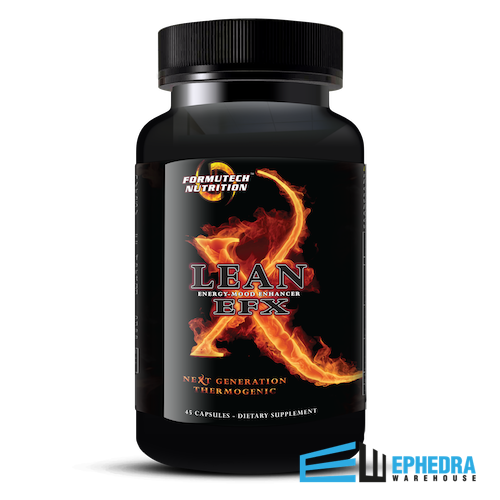 Lean EFX Refined by Formutech Nutrition contains proprietary blends of ingredients specifically designed to help those who are ready to get serious about weight loss. Even if you don’t know what each ingredient does on its own, you can be sure that Formutech Nutrition has carefully crafted Lean EFX Refined to ensure your success. 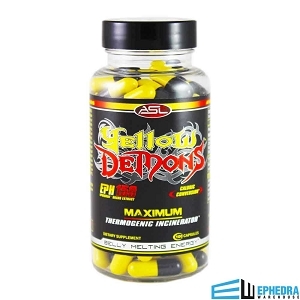 Making weight loss easier is the main goal behind the design of Lean EFX Refined by Formutech Nutrition, and there are a number of ways in which this happens. Appetite control – Lean EFX Refined by Formutech Nutrition helps you get cravings and hunger pangs under control. When you can control your appetite, you can cut the calories in your diet without feeling like you’re struggling. You can stick to a more rigid diet plan, even if you’ve had troubles sticking to simple plans in the past. 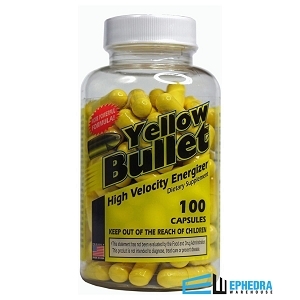 Energy boost – When the human body has fewer calories coming in than it is used to, it can feel tired and worn out. With Lean EFX Refined, you can overcome this feeling and feel energized during the entire day. Hitting a workout hard is just an important as controlling calorie intake. It's clear why other people have turned to Lean EFX Refined by Formutech Nutrition for their weight loss needs. If you’ve been unsuccessful with losing weight because of your appetite, your energy, or your metabolism, Lean EFX Refined can help. Think about the troubles you have with weight loss before you choose a weight loss supplement, so you can find one that addresses the root cause of the excess weight. As you begin to see what other dieters have experienced with Lean EFX Refined from Formutech Nutrition, you can make a better decision about your diet supplement needs. Take some time to find reviews of Lean EFX Refined by Formutech Nutrition, and read them carefully. The more reviews you read, the more likely you are to see someone else with the same situation as you. And then you can see how the other dieter fared in their weight loss efforts. While not all dieters have the same experience, the overall results can give you great insight into what you can expect. This will motivate you to keep with your diet plan and your exercise schedule. 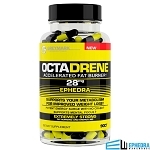 You can also look at reviews to see what side effects you might experience with Lean EFX Refined by Formutech Nutrition. Though these may not happen to you, it can help to know what might happen as your body adjusts. Though it would be easier to take a pill and be done with weight loss, that’s only a part of the equation. To make sure you keep the weight off, you need to start building new lifestyle habits. This means you need to start changing the way you look at eating and exercise. To support your weight loss, you can start by cutting out the junk foods, sugar, and extra calories, like soda. By making smaller changes, it will be easier to transition to a new way of living. Once you change one habit, you can change another, then another and another. The same plan can be used for exercise as well. Start with five minutes of exercise and then add five more minutes, and then add more. Once the exercise becomes easy, then you can add more or start using weights to make it more challenging. You can also increase the results of Lean EFX Refined from Formutech Nutrition by drinking more water and getting more sleep. When you include these new habits, you will support your body’s health, and you will reduce stress that can lead to overeating and skipping your exercise routine. Losing weight will not only help you look better, but it will also help you feel better. When you use a supplement like Lean EFX Refined by Formutech Nutrition, you will get the added help you need to change the way you live, the way you feel, and the way your body looks. As with any new medication, check with your doctor before adding Lean EFX Refined your supplement regimen. To ensure best results and to avoid potential side effects, please follow the instructions carefully. If you feel any discomfort, contact your doctor.